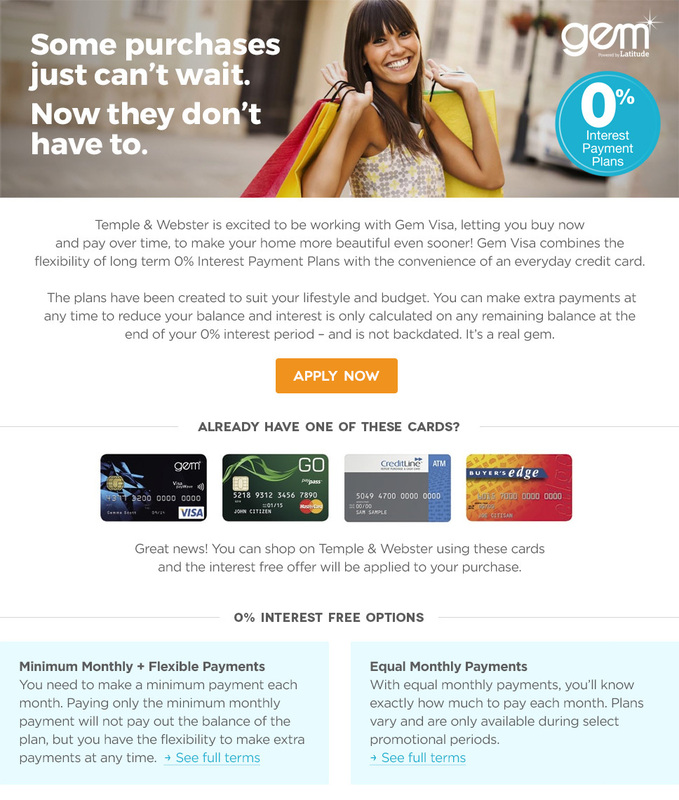 • You can also use your Gem Visa as an everyday credit card. Shop with ease – anywhere, anytime. • To receive 6 months interest free on any purchase, all you need to do is meet the terms of the promotion (minimum spend amount) and pay using your Gem Visa credit card – it's that simple. The 6 months interest free is then automatically applied to your account. • For longer interest free terms, if you're already a cardholder, select % Interest Free at checkout to see which interest free promotions are currently available (minimum spends will apply). You can then purchase up to your available credit limit. Who can create a Gem Visa card? Applicants must be 18 years of age and a permanent resident of Australia to be eligible for a Gem Visa card. Like most financial institutions, Gem Visa work on a credit check system and will consider if the card is unsuitable for you given all the circumstances. Gem Visa also need to make sure they are identifying the right person, to prevent fraud. Gem Visa take many things into consideration when reviewing an application. And, while they don’t disclose the specific details of our criteria, if you’re declined they’ll let you know in writing. If you apply online and provide all the necessary information, Gem Visa can give an answer on your application within 60 seconds in most instances. In some instances further information may be required to process an application. If further information is required Gem Visa will inform you during the application process. Credit limits vary from person to person. The information you supply in your application will help Latitude Finance determine your credit limit. If your application is approved, Latitude Finance will then let you know your credit limit. You'll receive a statement every month, showing the minimum monthly payment amount you're required to make and the due date, plus any overdue payments and over limit amounts. You can choose to receive email alerts to remind you when your payments are due. Simply log-on to the Online Service Centre to set-up alerts. The amount you need to repay appears on your monthly statement. If monthly payments are required, it's calculated at 3% of the total outstanding balance or $25, whichever is greater (plus any overdue payments and over limit amounts and any instalments payable on instalment purchases). You can set up a direct debit to make sure your minimum monthly payments are made on time automatically.Remember, to avoid any interest charges at the end of your interest free period, it is likely that you will need to pay more than the minimum monthly payment each month. Instalment Interest Free is one of the two 0% Interest Payment Plans available on Temple & Webster. With equal monthly payments, you’ll know exactly how much to pay each month. Plans vary and are only available during select promotional periods. Review available promotions online to discover if this plan is available for you. Can't find what you're looking for? Visit the Gem Visa website.